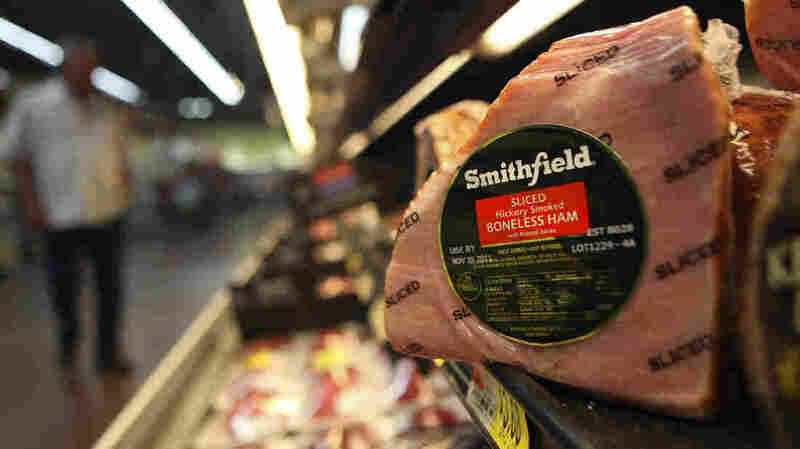 Smithfield Foods To Be Sold To Chinese Firm For $4.72 Billion : The Two-Way The makers of Smithfield Ham, an icon on America's culinary scene for decades, are selling the company to Shuanghui International Holdings Limited, for nearly $5 billion in cash. The deal also includes an exchange of debt. Smithfield Foods, makers of ham products under a variety of brand names, is being purchased by Chinese food maker Shuanghui International, for $4.72 billion in cash. In addition to Smithfield, the company's brands include Armour, Eckrich, Gwaltney, Kretschmar, and others. The company's roots stretch back to 1936, when the Luter family opened a packing plant in Virginia. Terms of the purchase value Smithfield's stock at $34 a share — a premium of more than 30 percent over the company's closing share price yesterday. The Wall Street Journal, which first reported the sale, says the company's shares rose sharply before the markets opened Wednesday. The deal will require approval from U.S. regulators before it is final. "This is a great transaction for all Smithfield stakeholders, as well as for American farmers and U.S. agriculture," Smithfield president and CEO Larry Pope said. "We have established Smithfield as the world's leading and most trusted vertically integrated pork processor and hog producer, and are excited that Shuanghui recognizes our best-in-class operations, our outstanding food safety practices and our 46,000 hard-working and dedicated employees." Shuanghui International is the majority owner of Henan Shuanghui Investment & Development Co. — "China's largest meat processing enterprise and China's largest publicly traded meat products company as measured by market capitalization," according to a news release. "China is the world's biggest producer and consumer of pork and the third-largest market for U.S. pork," Reuters reports. "In recent months, a series of food safety scandals have dented consumer confidence." Smithfield's headquarters will remain in Virginia, according to a press release announcing the deal this morning. The companies also said that Shuangui will not close any Smithfield facilities, and will leave all employee agreements — and the existing management team — in place. The purchase would further solidify an economic relationship between China and Virginia that has been growing. The state has sent several trade missions to Asia in recent years, helping China become what Gov. Bob McDonnell calls "far and away our largest trading partner," as member station WAMU recently reported. McDonnell made that comment earlier this month, when he announced Virginia's $638 million of agricultural exports to China in 2012. Pork and poultry placed third on the list of the state's exports; the top spot was taken by soybeans.